While orchestras in Los Angeles, Philadelphia and Indianapolis have chosen music directors in their thirties and younger, the Chicago Symphony Orchestra has found its own way to a new school. The Windy City’s 70-year-old maestro, Riccardo Muti, is enthusiastically performing new works by the 35-year-old American Mason Bates (who is also known as DJ Masonic) and the 31-year-old London-born Anna Clyne. Both composers have been in house with the orchestra since 2010, working among the musicians, soaking up the tradition and availing themselves of Muti & Co. expertise. But artistic influence cuts both ways, and the Italian maestro seems delighted by the irresistible imaginations and energies of his two Mead Composers-in-Residence. The world premieres by Bates and Clyne are CSO commissions, first performed locally with additional performances scheduled for a tour of San Francisco, Costa Mesa, Palm Desert and San Diego Feb. 14-19 and during opening week of the 2012-13 season at New York City’s Carnegie Hall. More is to come from the relationship — Muti recently extended both of their contracts through the 2013-14 season. 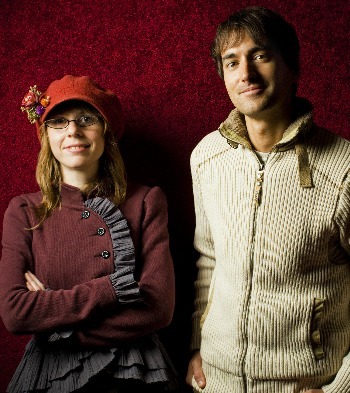 Mason Bates‘ futuristic world vision is inherent in the title of his new work, “Alternative Energy.” Anna Clyne sets her “Night Ferry” in a timeless psychological landscape. Both works are unmistakably original in voice. Their latest compositions also show prodigious assimilation of the symphonic past into their respective sound worlds. Mason Bates wrote the 25-minute “Alternative Energy” for traditional symphony orchestra plus junkyard car parts, recorded sounds from an atomic particle collider and other inventive electronica. He says that he was influenced by the formal device of the recurring theme, or idée fixe, in Hector Berlioz’ 1830 “Symphonie fantastique,” which follows the arc of a doomed love affair and which made a deep impression on Bates when he heard Muti and the CSO perform it in September 2010. Bates traces the arc of a similarly wild and besotted fixation, between mankind and energy itself. Anna Clyne took her inspiration not from Berlioz, but rather from Schubert. Muti told audiences during a rehearsal that he felt the music of Clyne and Schubert was connected in spirit. In “Night Ferry,” Clyne came up with a ravishing 20-minute work that looks as intensely inward as Bates looks out. Although Clyne’s “Night Ferry” isn’t yet recorded, there is a connective thread to the style of her 2009 work for 15 strings called “Within Her Arms” (video below). “Night Ferry” often shares the same sense of a soul engulfed in sadness — one of “Night Ferry’s” most compelling motifs is a chorus of exquisitely somber sighs. And although the new work also exercises a full symphonic palette, with violent contrasts of mood and greater length, it still draws upon the same deep well of emotion and builds gradual intensity through closely patterned repetition, like overlapping waves, or the rustling of leaves, driven by a changing wind. Bates — who has been writing full-scale pieces for symphony orchestra since his high school years, and been active as a DJ on the club scene since his student days at Berkeley — has more freely integrated those two aspects of his creative activity which once he considered separate. In this 2009 clip from a performance of “Warehouse Medicine” from “The B-Sides” by the YouTube Symphony, one can sense more of a club persona in the music. Bates is electronica soloist, with the orchestra in a collaborative role. By contrast, “Alternative Energy” shows freer, more idiomatic writing for the symphonic instruments, with the percussion section in particular blending right into the electronica. The result is a sense of orchestral sound expanded from within. Electronica enters “Alternative Energy” only after the first (Henry Ford) movement. The evocation of an eerie industrial wasteland in the third movement is largely achieved through traditional acoustical means. At the movement’s end, it’s the digitally created shock effect at its climax, rather than anything in the orchestra, that seems oddly wimpy. Overall, the work is free of that sense of lockdown on a click track that plagues many works involving pre-recorded sound. There is still the trademark muscular pulse, and the multi-lingual fluency with other musics of our time, that is a mark of Bates’ repertoire. What a great time to be a composer with the Chicago Symphony Orchestra. By their own accounts, Bates and Clyne have found friends and supporters among the musicians. Bates took percussionist Cynthia Yeh with him to help find his array of old fenders and other junk with sonic potential. Clyne says she found herself thinking about specific players as she wrote certain passages in “Night Ferry,” such as a solitary piccolo line performed by Jennifer Gunn, who is the lone voice of calm after the first violent storm. More than a dozen members of the orchestra have become applauded regulars with younger audiences in the CSO-sponsored MusicNOW concerts, curated by Bates and Clyne at Millennium Park’s Harris Theater. Crowds mingle over beer with performers at DJ’d after-parties and show no difficulty with experimental and contemporary fare. What’s next for these composers? Clyne’s at work on a double concerto for violinists Jennifer Koh and Jaime Laredo. It’s part of a performance project called Two x Four which will also include works of J.S. Bach, Philip Glass and David Ludwig. Bates’ “Mass Transmission,” for chorus, organ and electronics, written for the San Francisco Symphony Orchestra’s American Mavericks Festival, will receive March performances in San Francisco, Ann Arbor and Carnegie Hall. Bates continues to collaborate with conductor Benjamin Shwartz and designer-director Anne Patterson in a project called Mercury Soul. Its mission is “to present classical music in new ways to a new generation.” The next event is late at night March 23, a “Pulse” concert at Miami’s New World Symphony. Captions and credits: Top to bottom: Anna Clyne in her studio. Mason Bates rehearsing “Alternative Energy” on the Chicago Symphony stage at Orchestra Hall. Clyne and Bates together. 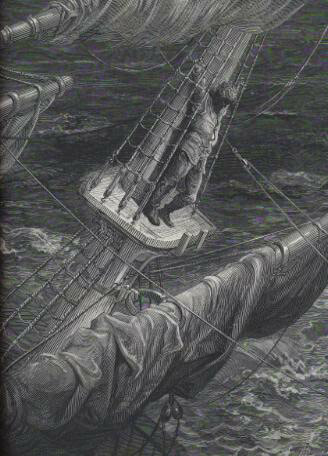 Engraving by Gustave Doré from Samuel Taylor Coleridge’s “The Rime of the Ancient Mariner. 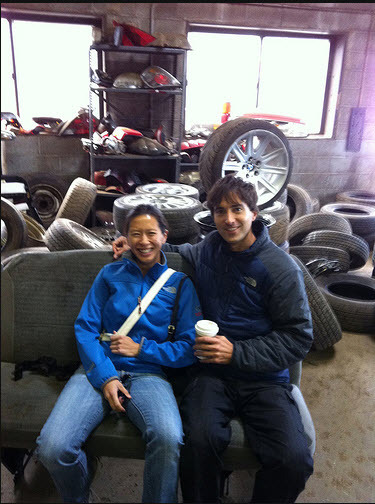 At the junkyard with CSO principal percussionist Cynthia Yeh and Mason Bates. (All CSO photos by Todd Rosenberg.) 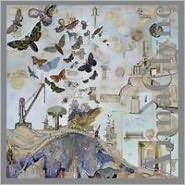 “Blue Moth” CD jacket of Anna Clyne’s forthcoming album, with artwork of Josh Dorman.